Matt and Mary – aka M&M 😉 returned to their hometown in charming Hamburg, PA for a sweet wedding late last month at St Mary’s Catholic Church. 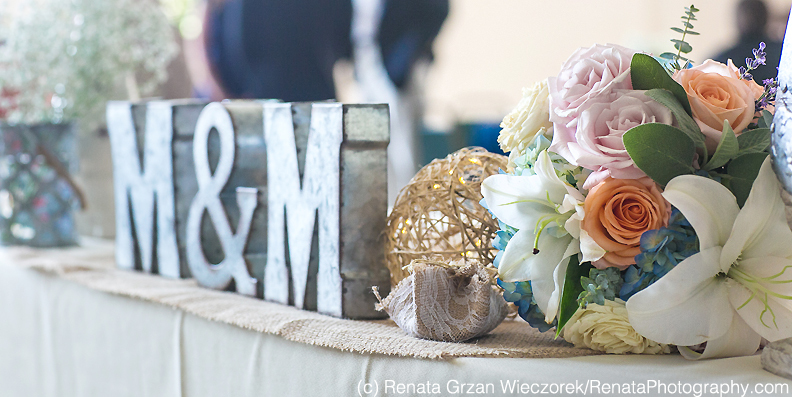 Lots of little personal touches and French country theme made their laid-back Friday afternoon wedding simply delightful and very memorable. But, it was a hot one! We all stayed indoors as much as possible, yet did manage to sneak out at the end at the day when the sun was setting for a little stroll and some photos. On a personal note, I’m always so humbled when clients end up becoming friends. That’s a special perk of documenting and sharing in life’s most meaningful moments. It binds you. This time, however, and old friend became one of ‘my brides’ as I call them. 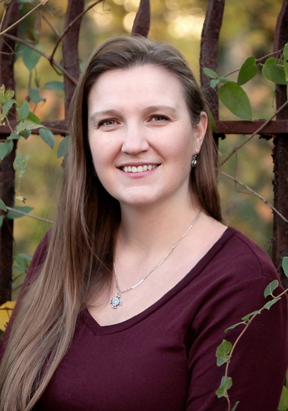 Having only recently met Matt, I’ve known Mary since grad school, from some twenty years ago! Let me tell you, it took some serious willpower to hold back the waterworks. I’m just so happy to see Mary so happy! These are the highlights of their unique wedding day story. Enjoy! 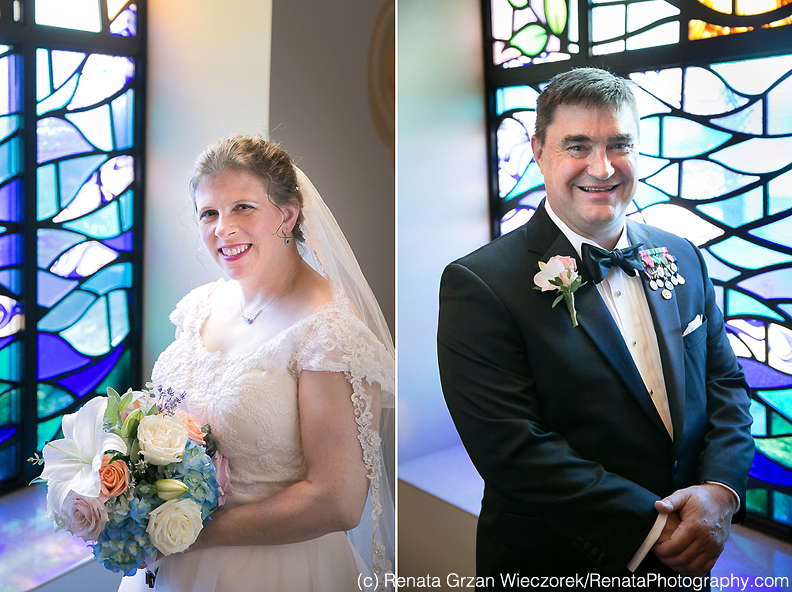 Some, O so lovely, portraits of the bride and groom in the colorful stained glass window light of the new church. Hands down my most unique First Look ever! 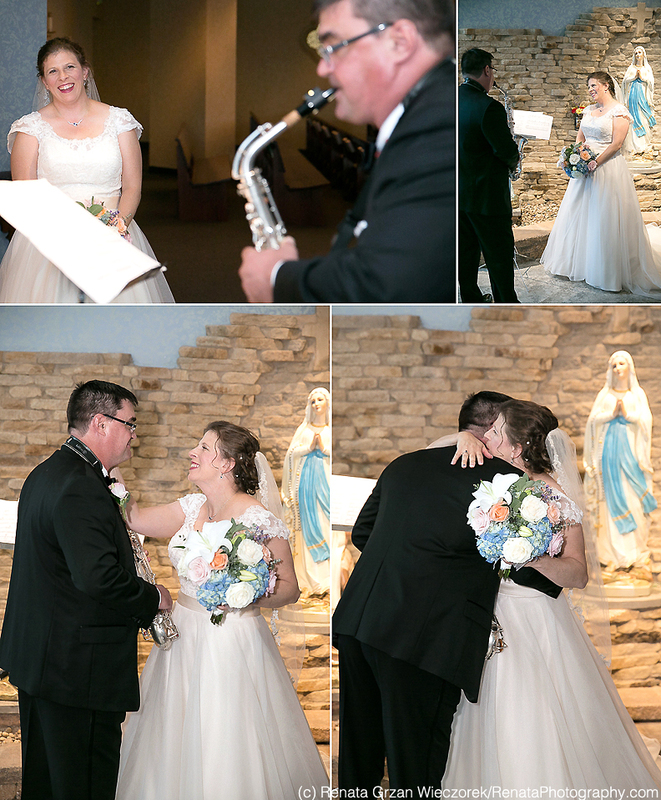 The groom called out his bride to meet him with a sax solo. Very smooth! Couldn’t resist some more portraits in that lovely light while they had their quiet moment before the wedding. The groom unveiled a refurbished pew as a gift for the bride, that was saved from the original St Mary’s Church where they met –three decades ago! The groom playing during his own preludes! He did make it to the altar in time to greet his glowing bride, escorted by her nephew. They made it to their special pew, while their friends provided the music for the Mass. Father delivered a moving homily about marriage and recounted Mary and Matt’s unique journey in their own words. The exchange of rings and the Nuptial Blessing. A lovely visit to the Holy Family Altar where the newlyweds laid a vase of flowers and offered their prayers and intentions. Having known each other since high school, and then taking separate paths in life, Providence has brought them back together again. Groom offering a kiss of consolation during the ordeal of getting bustled. Let the silliness begin! Can’t forget the bridal shoes and bouquet. Off to the party at the parish hall… and 10 points to the groom for carrying her shoes! Indeed, “It’s never too late, to live happily ever after”! Their custom guestbook (made by yours truly) from their engagement session, will be a great keepsake and so fun to read in years to come! A variety of toasts: traditional, silly, and military inspired. Plenty of tasty hors d’oeuvres, treats, drinks, and full buffet to keep everyone going. But, O, that chocolate fountain was fun! The newlyweds finally getting a chance to sit and eat after visiting all the tables. It just so happens to be his birthday, and he is given a special toast with all the guests singing “Happy Birthday”. A great way to never forget your anniversary, for sure! When you’re military, even retired military, you gotta cut the cake with a sword! I see the bride likes to live on the edge! Either that, or is demonstrating her unwavering trust of her new husband! The sheer delight and joy of the first dance. It’s been a long time coming for these two. Those would be the impressive medals of a Navy Commander. One of my very favorite images to make, recording those soft bridal details that live in the memory of that perfect wedding day. After dinner, and once it cooled down some, we snuck out into the dusk light for some photos on the soft rolling hills of Pennsylvania. What a lovely end to the day, a song and a stroll into the sunset! Best wishes and many blessings to you, Mary & Matt! May you live ‘happily ever after’! A friendly reminder: the images on this site are not to be removed or screen captured. Thank you. It was a joy, Mary!